I am the mother of 3, a Advertising Representative and Photographer for a local newspaper, and a Full time College student double majoring in Criminal Justice and Art. I have loved the VW Bug ever since I can remember. One day I finally spotted one sitting in the back of a local car lot and investigated it. I should know better then to trust a car dealer but I bought it anyway under the pretense that it "ran like a dream just needed a battery". Those were his words. When I finally got it home you don't want to know the words I had for him! Since this was my first Beetle I had no clue what to look for or what to expect. Turns out I bought an auto stick that turned up just to be a stick and didn't do much else. Well after a new transmission, gas tank, and numerous other parts it now does what it was said to do "Runs like a dream!" As a matter a fact it runs better than any other car in my yard. After spending the money on the mechanics I didn't have a cent for a paint job so being an Art major I just looked at it as a canvas. I drove it daily and added to it when I got time. I am now looking at doing an actual restore job with some alterations and a different paint scheme. I enjoy surfing the net looking at VW's, old, baja, restored, and especially the art car ones! Feel free to contact me with any comments or if you just want to share a story! 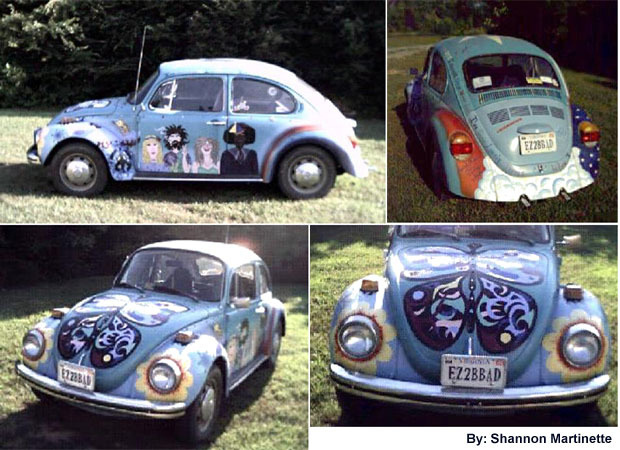 After that Shannon got in touch with me and sent the pictures and now the story of her self-made "Painted Car". This kind of approach is very wellcome, because it is exaclty what I mean with my survey, i.e. to get people involved, showing their artwork or sharing their information about the subject VW Beetle and the Pop Art. I thank Shannon for her participation and wish many miles of happy deriving with her VW Beetle. 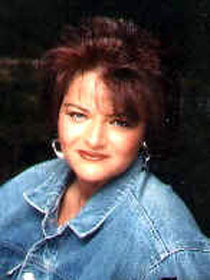 As a matter of fact I thank Vicki for having given the information to Shannon! Home Page: Being made, please wait a bit.